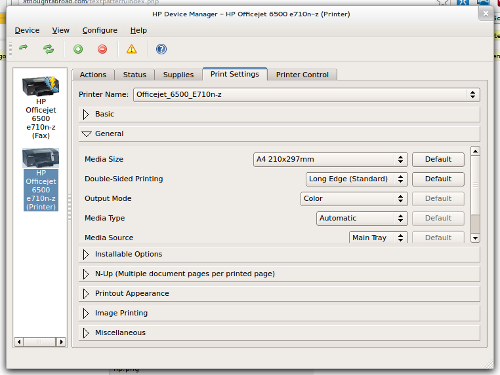 A road story on how to use my HP Officejet 6500 E710n-z printer on Arch Linux without dispensing the duplex unit and the feed scanner. So far, the purchase of a HP Officejet 6500 E710n-z printer has been a double-edged sword. One the one hand, it is a great printer because it features a duplex unit and a feed scanner. The former reduces paper usage, and the latter allows me to scan multiple pages even if the printer is placed far away under my desk. On the other hand, however, making the printer cooperate with either Windows or Arch Linux has turned out to be rather challenging. Here are some keys that helped me to make the printer work on Arch Linux — duplex-unit and feed scanner included. HPLIP 3.12.11 offers both a hpcups driver, and a hpijs driver. However, I found some bug with hpijs and it seems that that the hpijs driver is no longer supported. The same bug report contains a recipe, where I was recommended to use the utilities hp-plugin, and hp-setup in order to setup the printer. While I am not 100% sure that hp-plugin is required for my printer model, I decided to follow the recommendation. Using the hp-plugin utility failed at the first attempt because it uses a python script that is accidentally interpreted by Python 3 on Arch Linux. Here, using virtualenv2 came to the rescue. 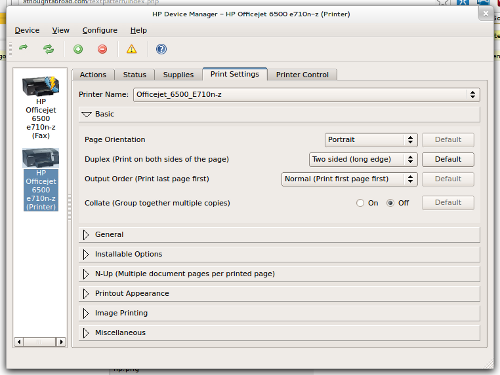 Following the advice given in the bug report, I used the hp-setup utility instead of the CUPS web interface to setup the printer, and chose to use the PPD file /usr/share/ppd/HP/hp-officejet_6500_e710n-z.ppd.gz. While printing worked without further tweaking, the duplex unit was not available. Here, trying several different print settings in the HP Device Manager did the trick. Instead (thanks to the excellent help), you could probably just specify that you have a duplex unit installed under “Set Default Options > Options Installed” in the CUPS web interface. In order to make scanning work, make sure that /etc/sane.d/dll.conf lists an entry “hpaio”.